I’ve run with a lot of different groups over the course of things. In my 16 years on this earth, I’ve been with the punks, the skids, the jocks, the nerds, the burnoutsâ€¦ and a lot of other ones that no one cared to name. Have you ever picked up a guitar and felt that warmth, that tingle in your fingertips that attracts your hands to the strings like magnets? I get that with musical instruments, but I get that with groups, too. I see a group like the burnouts and my body is just drawn to them, warm like Christmas morning, ready to be easy and smile and spend a week transitioning from whatever I was before to the requisite holey t-shirts and flannel, or whatever the uniform of the group is. My parents were never very cool with how I am, not from the first ultra-sound onward. Things went really awry when the Weekly World News got a hold of some pictures of my medical marvel ankles and spread the story to all the cranks and conspiracy theorists. I was dumped unceremoniously on child services and started holding the hand of whoever was taller than me, bringing my caretakers over the threshold from normalcy to the weirdness that surrounds me. It wasn’t until I turned eleven and puberty hit that I started to really feel the pull to be somewhere else. That’s when my dreams started feeling lucid, like I could control something that happened in the landscape, and I could here messages coming from an entity larger than myself. A morning news show did a story with me once. My foster Dad had set it up, trying to earn a quick dime, even though I had just helped him fix a couple of horse races in his favor. The network showed the wings on my feet, they showed me hover, the two hosts asked if people ever bullied me for being different. I didn’t have much to give them, except for the messages I would get in my lucid dreams. I told them that they were dreams and I told them that I wasn’t positive that anything I was saying or what people said about me was true. “You get messages?” the fresh faced host asked. “Like text messages?” They both laugh. “No, like a voice in a dream.” They sober up quickly. I can tell they think I’m crazy. When people think you’re crazy, their voice gets an edge to it, and they try to remain three inches away from your personal space. “And what do they say?” the girl anchor asks. “What gods?” They want me to say it, I can tell. They may have said it in the promos and the lead-in, but they are all innocent and wide-eyed now that we’re really into it. “Do you think you’reâ€¦” He trails off, scared. “Do I think I’m what?” We’re both dancing around it now. One of us will say it, definitely not me. For effect, I flew off, and threw the handful of flour I had been holding, just because I thought it would be funny. The audience and co-hosts gasped and everyone looked up to the ceiling. I floated down the fire escape and then dashed away. Here’s the funny thing about life after that interview – it didn’t change at all. People don’t like to be challenged, their world view held in question, so I think they wrote me off as a stupid street magician and called it a day. I hopped schools a lot more often after that. Foster families didn’t usually keep me for more than a month or two – I attracted too many thieves and thugs and other unsavory sorts. For some reason, they come to me for guidance. I criss-crossed the country at least four times, waiting for the country to declare me independent. When I turned 17, I started asking questions in the lucid dreams – I’d be floating, unable to move, and a voice would tell me things to do. Find so-and-so and tell him he shouldn’t do whatever, or else he’d die. That sort of thing. The gods still like to meddle, but they’ve kept it to a minimum since we discovered electricity and harnessing soundwaves. 18 rolled around and I felt free of invisible shackles. I could fly, too, thanks to a helmet I found in the center of a glacier due to a little lucid dream guidance. All of the weirdness of my life was going to be behind me – I had complete control of my existence. It was during a joyride from LA to San Francisco that I felt it – sort of like the familiar pull to a guitar, or a group of skids, only all-encompassing. I was like Pooh Bear stuck in the window – pulled both directions by two conflicting parties. Hades and the Heavens both wanted my attention. To be honest, I wasn’t surprised this day finally came, but I wasn’t excited about it. I didn’t have any desire to meet anyone else like me, nor did I want to fulfill my duty of ascending to the heavens to bring messages earthward, or accompanying souls to their doom in Hades. I had seen the signs even before I could talk – who I needed to bring where, and how long they had left. 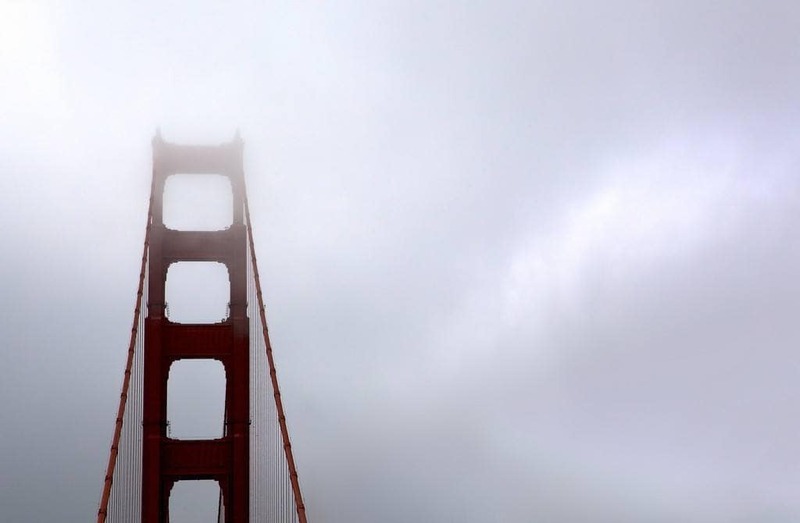 I saw a cloud bank over the golden gate bridge and engulfed myself in it, unhappy with the sodden thoughts of new responsibility. At least I’d hear the good news first. Posted on Sunday May 8th, 2011 Wednesday March 26th, 2014 by Max Elman. This entry was posted in Photos & Stories and tagged gods, hermes, san francisco, teenagers. Bookmark the permalink. You already know your parents are very nice and easy to visit with. I met them. Your writing leaves me to be myself. I love bridges. In the story “La Taza Azul” the event of “Volcano” becomes crucial in how I respond to future events as a result of my mental C-word Bridge. Keep writing. Your writing gives me insight. Maybe that is arrogant but that is how I feel.